I've been reading (devouring, really) a dystopian sci-fi novel recommended to me by the friendly bookseller across the street at Books Inc., and it's got me thinking about the future of humanity and the planet and what it's all coming to. In a recent conversation with a friend of mine, we decided that art really is a low-impact activity. By definition, handmade art isn't adding to the pile of mass-produced goods flooding the world. And on that note, recycled art really is the best of all. I rail against book breaking, because to me books never lose their original purpose until they are broken. Other things haven't proven to be as durable. 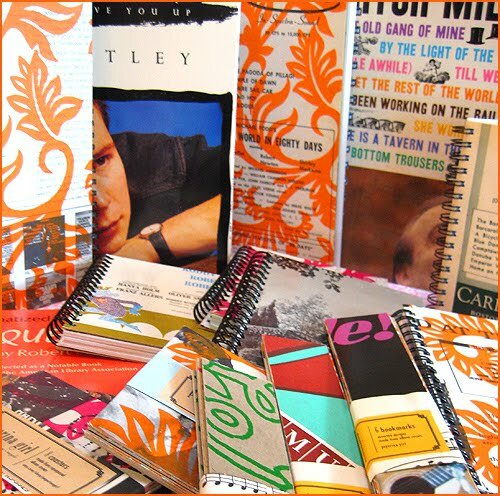 So we've been happy lately to pick up the line of journals made with repurposed album covers by Peperina Girl, and just today two separate artists contacted me to talk about selling their works which are made from recycled clothing. Now and perhaps far into the future, everything old will be new again.